Wave action during last year's El Niño removed sand from beaches along the Isla Vista coast. The ocean pounded Sands Beach on the west side of Coal Oil Point during last year's El Niño. Last winter’s El Niño might have felt weak to residents of Southern California, but it was in fact one of the most powerful climate events of the past 145 years. If such severe El Niño events become more common in the future as some studies suggest they might, the California coast — home to more than 25 million people — may become increasingly vulnerable to coastal hazards. And that’s independent of projected sea level rise. New research conducted by U.S. Geological Survey (USGS) scientists and their colleagues at UC Santa Barbara and six other institutions found that during the 2015-16 El Niño winter beach erosion on the Pacific coast was 76 percent above normal, and that most beaches in California eroded beyond historical extremes. The results appear in the journal Nature Communications. The research team assessed seasonal beach behavior for 29 beaches along more than 1,200 miles of the Pacific coast. The investigators’ efforts included making 3-D surface maps and cross-shore profiles using aerial LiDAR (Light Detection and Ranging), GPS topographic surveys and direct measurements of sand quantities. They then combined that with wave and water level data from each beach between 1997 and 2016. 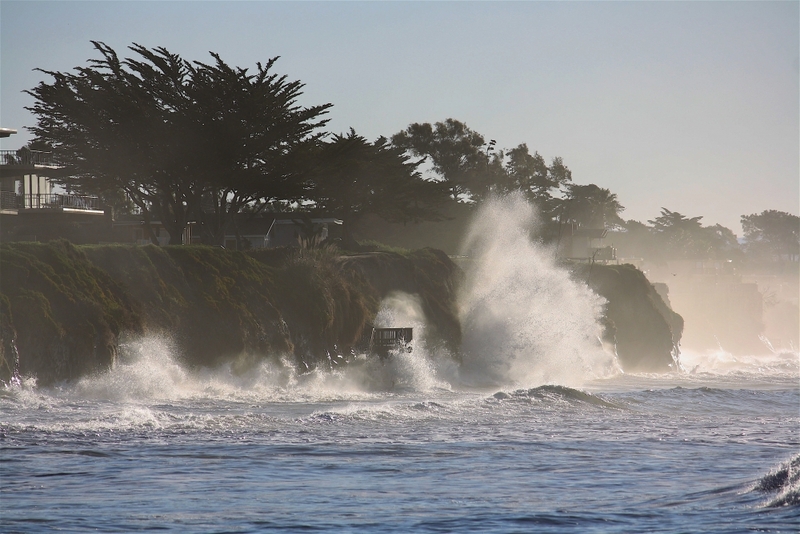 Winter beach erosion — the removal and loss of sand from the beach — is a normal seasonal process, but during El Niño events the extent of erosion can be more severe. The 2015-16 El Niño was one of the three strongest events ever recorded, along with the El Niño winters of 1982-83 and 1997-98. From a water resources perspective though, the most recent El Niño was largely considered a dud due to the unusually low rainfall, particularly in Southern California, which received 70 percent less rain than during the past two big El Niño events. “However, the waves that attacked our coast, generated from storms across the North Pacific, were exceptional and among the largest ever recorded,” Barnard said. “Further, the lack of rainfall means the coastal rivers produced very little sand to fill in what was lost from the beaches, so recovery has been slow.” Rivers remain the primary source of sand for California beaches, despite long-term reductions in the 20th century due to extensive dam construction. While most beaches in the survey eroded beyond historical extremes, some fared better than others. The condition of the beach before the winter of 2015 strongly influenced the severity of erosion and the ability of the beach to recover afterward through natural replenishment processes. Unlike California, many Pacific Northwest beaches have gained sediment in the years leading up to the 2015-16 El Niño. That’s due — at least in part — to more production of sand from local watersheds, dune growth and a series of mild winter storm seasons. Mild wave activity in the Pacific Northwest and artificial augmentation of beaches (adding sand) in Southern California prior to the winter of 2015-16 prevented some areas from eroding beyond historical landward extremes. “It looks like climate change will bring us more El Niño events, possibly twice as many, at twice the frequency as in the past,” Hubbard said. “So this is a taste of what’s coming. Beach survey collection was funded by the U.S. Army Corps of Engineers, the California Department of Parks and Recreation, the California Division of Boating and Waterways, the USGS, the Northwest Association of Networked Ocean Observing Systems and the National Science Foundation.